Today I am going to share with you a natural bodybuilding back workout that you can do from the comfort of your home with some adjustable dumbbells and a bench. I got a great back pump with this routine and I know that you will too! As usual, this workout is short but intense! Two giant sets will take you around 7 minutes. This is 1 set. Rest 60 seconds and repeat 1-2 more times. 1) Train the back twice a week. 3) If you have more time, you can add a third set. That would make the routine around 10 minutes in length. Try this routine out and let me know how you liked it below! If you liked this video blog, remember to hit the LIKE button below and also feel free to share it with your friends via GOOGLE PLUS, TWITTER and/or FACEBOOK. And if you have not done so already, sign up to my FREE Weekly Newsletter and by doing so, you get a FREE E-book that shows you How to Gain Muscle as You Get Your Abs. Today I am going to share with you a natural bodybuilding chest workout that you can do from the comfort of your home with just a pair of adjustable dumbbells and a bench. This chest routine is guaranteed to put a nice pump on your chest muscles and induce some growth! This workout will not take too long….2 giant sets will take you around 7 minutes. 1) Train the chest twice a week. 3) If you have more time, you can add a third set. That would make the routine around 10-15 minutes in length. Today I am going to share with you a natural bodybuilding abs workout that you can do from the comfort of your home with no equipment needed. This abs routine is guaranteed to put a nice burn on your abs! 1) Train the abs twice to three times a week. Note: For guys that are at around 12% body fat and women at 15% you can implement a carbohydrate cycling protocol that enables you to go down to the lower body fat levels. For more information on carb cycling, take a look at this article: Get Lean with Carb Cycling. Note 2: If you are looking for a supplement that helps to control your appetite and increases your energy, you may want to consider trying the Lean Body Fat Burner. In this natural bodybuilding video, IFBB Pro Ben Pakulski and Hugo Rivera talk about bodybuilding training and how MI-40 helps you to gain muscle mass! Bonus: Natural Bodybuilding FAQ With Ben: How Do I Know How Much Work is Enough? Today I am interviewing one of my friends in the fitness industry: Mike Westerdal. 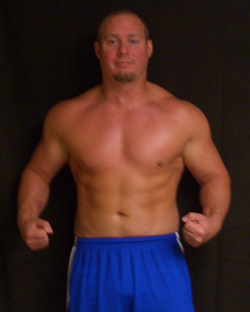 Mike Westerdal is a certified personal trainer and amateur powerlifter residing in sunny Clearwater, Florida. He enjoys being a contributing writer for REPS!, Iron Man, Powerlifting USA, and dozens of other publications. Westerdal is the founder of Critical bench located at http://www.criticalbench.com. Mike’s fitness publishing company boasts being one of the Internet’s first strength training and muscle building Web sites online. His most popular workout is the best selling Critical Bench Program 2.0 that has successfully helped over 17,238 clients increase their bench press by an average of fifty pounds in ten weeks. With this unique power-building approach you’re guaranteed to build all around size and strength. So without further ado, I will get started with this revealing interview. Check out this podcast of me interviewing best selling fitness expert and IFBB Pro/Hall of Famer Lee Labrada discussing the topic of fat loss. Topics discussed are training, nutrition, and supplementation for fat loss as well as tips for success. Check it out, enjoy it and implement the information! Who says that you cannot attack your fat while going out to eat with friends and family? This is one of the biggest myths in the history of weight loss and is part of the reason that the supplement industry has grown to become over a 55 billion dollar industry! You see, going out to a nice restaurant and socializing is a great way to forget about all of the stress and problems you may be having at work. The problem is people do not know what or how to order a healthy meal while eating out. They simply follow what everyone else is doing instead of being conscious of their diets.